One of the happiest plants in my garden this summer is my Lemon Verbena. Not only does it not seem to be fazed by our extreme heat and humidity…it is thriving. I have never grown it before, so its resilience and determination have been a surprise. Its perky presence on my patio is a welcome sight… Even if its use were only ornamental, that would be enough for it to have earned it an annual spot in my garden. But of course, this lovely herb has other uses as well…many of them culinary. Prior to this summer I was familiar with Lemon Verbena because of its popularity in France (where it goes by the name of Verveine). It is a favorite there—in both its fresh and dried form—for making tisanes (or herbal tea). If you have a plant, you can make a tisane to enjoy this evening: simply snip off a sprig (or two) and place in a cup or mug. Add water that is just off the boil. Let steep for five minutes or so… Then enjoy. There is no need to remove the leaves before you sip. The flavor will continue to get stronger as it sits…but not unpleasantly so. I have enjoyed tisanes made at the home of my best friend from college (a Francophile for as long as I have known her—and who seeks out a Lemon Verbena plant every summer to make her beloved tisane de verveine), but had never considered getting a plant of my own. But this year, I scheduled a joint cooking class featuring the abundant produce of midsummer with my chef friend Nancy. Nancy planned to prepare an Italian jam tart and I wanted to make something—preferably ice cream—to go with it. As I thought about possible flavors, lavender honey came to mind…but I have already taught that. It was a short leap from lavender (an herb forever associated with France, in my mind) to verveine. Lemon Verbena is often used to flavor desserts—either by steeping a liquid (as for the tisane) or infusing some sugar. To infuse sugar, simply put some bruised leaves in a jar with some sugar, cover tightly and let sit for a couple of weeks—shaking every few days to break up clumps that will begin to form as the sugar absorbs the moisture in the fresh herbs. When the infusion is done, strain out the herbs and store the sugar tightly covered. Deborah Madison in her book Local Flavors recommends using about a quarter cup of leaves to infuse two cups of sugar. The sugar is especially nice used in something simple like a pound cake or shortbread cookies. 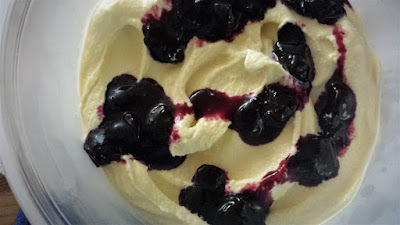 Nancy chose to use blueberries (from a local patch) in her jam tart. The combination of the blueberry tart with the lemon verbena ice cream was fantastic. I’m guessing that the combination would have been pretty fine with just about any jam made with the abundant berries or stone fruits of midsummer. 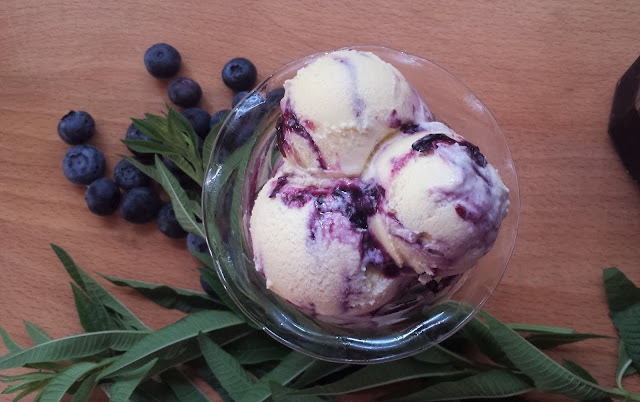 Because I liked the combination of the blueberries with the lemon verbena so much, the recipe I’m sharing today is the Lemon Verbena ice cream that I made for class…with a blueberry swirl. You can of course make the ice cream without the swirl and serve it with any number of the jam and summer fruit based desserts I have posted over the years (jam tart…jam bars…mixed berry crumble bars…)…but I have been enamored by the idea of a marbled lemon verbena ice cream ever since I ran across a lemon verbena and raspberry swirl ice cream while I was working on my recipe. You could of course make that exact flavor with some homemade raspberry compote. I also think blackberry (if you strain out the seeds) would make a great combination with the lemon verbena too. As far as the ice cream itself goes, I used the standard formula that I use in all of my ice creams. I use half milk and half cream and for every cup of cream/milk I use 2 egg yolks and 50 grams of sugar or honey. 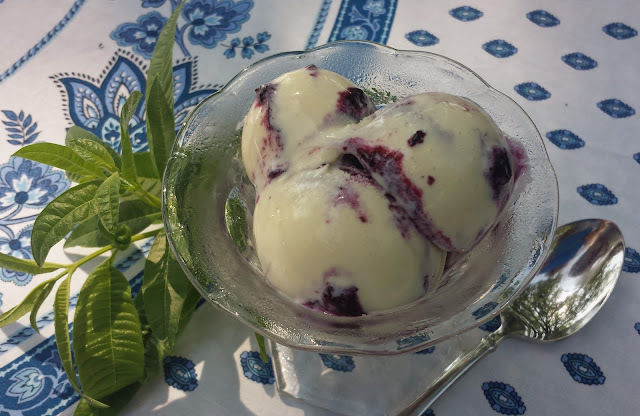 I usually only incorporate a small amount of honey (mostly because I like the way an invert sugar gives a softer and smoother texture to the finished ice cream), but for this ice cream I used half honey so that you can actually taste the honey…it is delicious in combination with the floral taste of the lemon verbena. Finally, I have given the amount of lemon verbena leaves by weight. It is my habit to cook and bake this way and it is a much more accurate way of measuring something like leaves that are kind of difficult to quantify (I’m guessing that one person’s “packed cup” of leaves would not weight the same as another’s). But since a lot of American bakers still don’t have a scale, I’m including a way to measure without it. Simply cut the leaves in rough 1/2 inch lengths and then drop them lightly into a 3/4 cup measure. When you get to the top, you have enough. But having said all that, I think you would end up with a pretty fine ice cream if you just grabbed a nice big handful of leaves. Your plant will be very happy and grow bigger after you have “pruned” it to make ice cream, too. So much so that you will just have to acquire an evening herb tea habit …. or make some infused sugar (so you can have cake or cookies with your tea) …and of course, make more ice cream. Place the milk and salt in a medium-sized, non-reactive saucepan. Heat to just under a simmer. Remove from the heat, add the verbena leaves, cover and let steep for an hour to an hour and a half (depending on how strong you want the flavor to be). When ready to make the ice cream base, strain out the verbena, pressing hard with a spatula or ladle to extract as much of the liquid as you can. Discard the verbena. Place the chilled heavy cream into a large bowl and place the strainer used to strain out the verbena over this bowl. Return the infused milk to the heat and bring to a boil. While the milk is heating, whisk the egg yolks with the sugar until smooth and thick. When the milk boils, temper the egg yolks by gradually whisking in about half to two-thirds of the hot milk. Stir the tempered egg mixture back into the saucepan and place the pan over medium heat. Cook, stirring constantly, until the custard is thickened and forms a path when you draw your finger across the back of the spoon (if you like. you may check the temperature with an instant read thermometer—it should be about 170° to 175°). 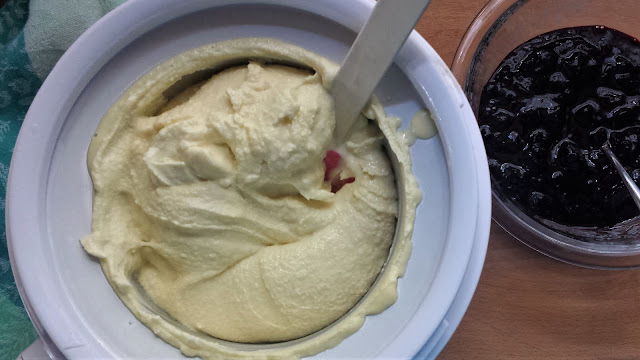 Immediately strain the custard into the bowl of cold cream. Add the honey and stir until the honey has melted. Cover and refrigerate until thoroughly chilled (eight hours or overnight). Freeze the ice cream in an ice cream machine according to the manufacturer’s instructions. When finished, transfer the ice cream from the churn to a chilled container. Choose a 1 1/2 to 2 quart container that is shallow and wide. Working quickly, layer in a quarter of the verbena ice cream (smooth it out into an even layer). 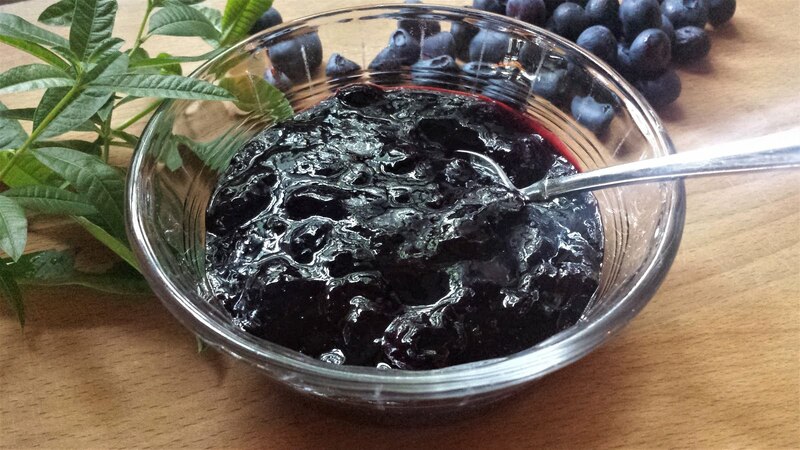 Dollop and drizzle a scant third of the blueberry compote. It is not necessary to marble it in (it will marble naturally as you scoop it to serve it). Repeat this layering of a quarter of the ice cream and a scant third of the compote two more times. Add the remainder of ice cream, once again smoothing it out. You should have a tablespoon or two of the compote left. Dollop this over the surface of the ice cream, marbling it in a bit, if you like. Cover the container and place in the freezer. Freeze for at least an hour or two before serving. Makes about a quart and a half of ice cream. Note: My original idea for this ice cream was to just use a homemade blueberry jam for the swirl. All of the jam makers out there know that this basically means using a substantially higher quantity of sugar (for this quantity of blueberries, around 1/2 cup plus 2 T.). 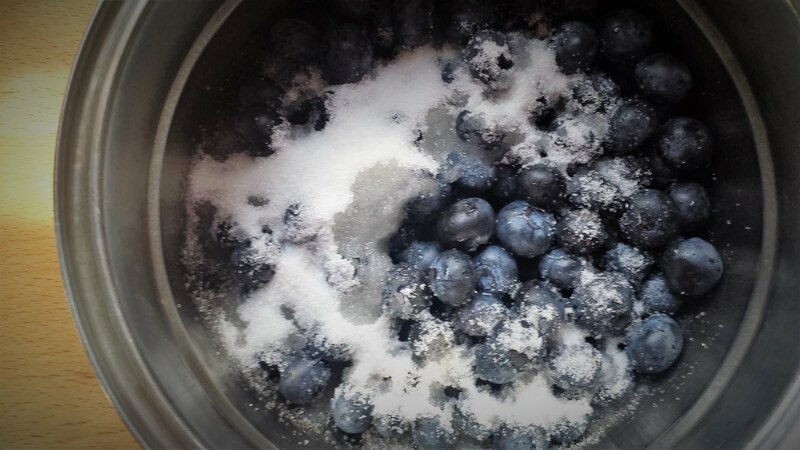 The texture of the frozen ribbon of blueberries when made with this higher quantity of sugar is quite smooth and suave. Unfortunately, the overall effect on the ice cream is one of tooth shattering sweetness (at least to my palate). If your berries are very tart, you might consider increasing the sugar in the compote. 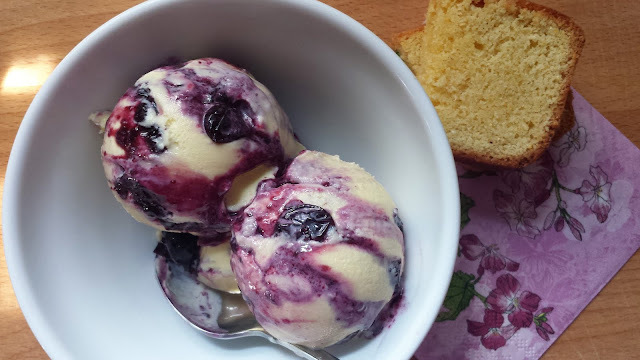 For moderately tart blueberries though, I love the counterpoint of the sweet, floral ice cream with the slightly tart swirl of fruit, and I am not bothered by the slight frosty-ness of the swirl when the blueberries are cooked with the lesser amount of sugar.